If someone were to ask you what smells horrible but tastes heavenly, you can bet the answer is none other than durians! Of course not everyone will agree with this. One good example is yours truly. I love the smell of durians and I love the taste even more! That’s why I cannot understand why some people hate the smell of durians. They said it smells like a combination of gasoline and rotting meat. How ridiculous! To me, durians smell and taste heavenly! The so-called “pungent” smell of durian only serves to make my mouth water. It is people who hated the smell of durians that led durians to be banned from hotels and airplanes. What a shame! Well, to the uninitiated, durians are also known as The King Of Fruits. And for good reason too. Just take a look at the fruit itself and you will know it’s not to be messed with! 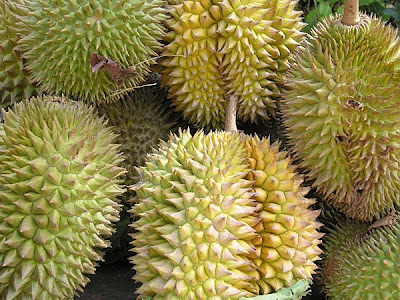 Why, durians are so popular that even Singapore built its famous Esplanade Theatre based on the fruit! 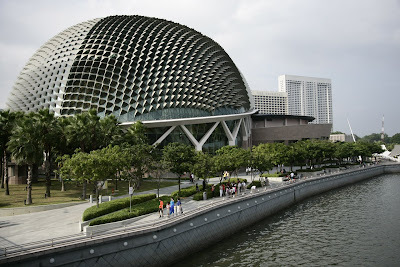 Look at those spiky rooftop of the Esplanade Theatre that resembles the spikes of the durian. It is said that durians have "eyes". That means you can walk inside a durian orchard and under rows and rows of durian trees and a durian will never drop on your head. Now I'm not sure if this is true because I do not dare put this to the test. Imagine how it hurts when the deadly spiky durian drops on you! What I do know is that durians mostly drop during the night and that workers who collect the fruit always wear helmets to protect themselves. When selecting a durian, you should always look at the stem. The stem should be big and strong, otherwise it's an old durian. Also, shake it a bit. If you can hear the seeds moving inside, that indicates the durian is no longer fresh. Once you open up the durian (with the proper skills, of course) the fleshy fruit inside will have you drooling to no end. If you have not eaten durians before, you must try it! That’s because a lot of people hate the smell but love the taste. So far, only a minority hate both the smell and the taste. And I have heard of no one who love the smell but hate the taste. So how do you eat the durians? With your hands of course! I have an English friend who actually ate it with fork and spoon! I could hardly believe it when I saw him doing that! It’s so funny I almost choked myself with the durian seed! And that reminds me – be careful when you eat durians. It’s not advisable to put the whole durian seed into the mouth or you may just accidentally choke yourself to death. In Malaysia, a lot of people like to eat the mangosteens after eating the durians. Mangosteen is a seasonal fruit just like durians. Seasonal fruit means they are only available during certain times of the year and not 365 days a year. Why mangosteen? Well, perhaps mangosteen season coincides with durian season, so these two are like marriages made in heaven. 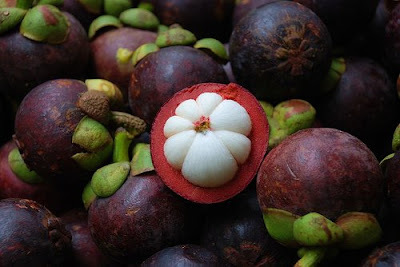 In fact, mangosteen is another very popular fruit native to Malaysia it’s a wonder why a direct selling company from USA called XanGo is selling mangosteen juice back to us Malaysians! However, the real reason why eating mangosteen after a bout of durians is recommended is because the mangosteen has “cooling” properties that balance out the “heating” effects of eating the durians. Its heating properties may also be the reason why pregnant women and anyone with high blood pressure are advised not to eat durians. There is also this advice that you should not eat durians and drink alcohol at the same time. People have reported to have died from this lethal combination. Although there is no scientific proof to back this up, it is advisable not to mix the two. One reason may be because both durians and alcohol are “heaty”. I personally doubt this combination will kill you, but if you also suffer from high blood pressure, then there’s a chance for that to happen. Perhaps you dare to give it a try and live to tell me the truth? Then I will get to debunk this “myth” once and for all! Another popular way to take away the “heatiness” after eating durian is to pour water into the empty durian husk, add a little salt and drink the water from the husk itself! And guess what? If you hate the durian smell that lingers on your hands, don’t even bother to wash them with detergent or soap. The smell will remain even if you wash your hands till the next day! The solution? Just pour water into the empty durian shell and wash your hands in it. The smell will disappear, as if by magic! And now, if you will excuse me, I would like to go enjoy my durians! One person's honey is another person's poison! My husband (who's a Malaysian) can't stand the smell of this glorious fruit, let alone taste it. LOL He's lucky there's non fresh ones here. my bug life, thanks! Yes, I agree durian do taste like sweet custard...yummy! cc, no wonder your hubby doesn't stay in Malaysia! haha! great insight. now i know how to choose durians! :) (usually i buy those open ones already lol). and this year, i really had my share of the king of fruits! haha. love the smell... love the taste! I love durians. They banned durians is because the pungent smell of the fruit tends to leave an aftersmell everywhere. I'd say, anyone who has been to Malaysia should try the king of fruits. my chocolate factory makes the best durian chocolates. Have you tried?!! 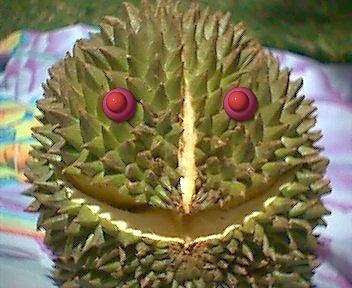 Never heard of durian has eyes thingy. But also never heard of anyone got hurt by a dropping durian. My girlfriend tried brandy after durian. It was long ago. She didnt die. For me, I will never want to risk my precious life. I like durian smell too! I purposely don't want to wash hand with the durian husk so that the smell will linger longer. LOL. Never had it. But thanks for the informative post. If I ever get the chance, I will definitely give them a try! eiling, OMG! Chocolate + durians - what a lethal combination! Both are my favourite foods! I must try it! jam, it's just old wives' tales. I don't believe durians have eyes! molly, so it's proven durian + alcohol won't kill! Then you should not worry about risking your life, unless you've got high blood pressure or other health problems. I have never seen or heard of a Durian but I would love to try it. What an interesting fruit that smells horrible but tastes great. My colleague brings a container to the durian stall. It sure cuts out all the hassle. Besides, she can turn away the less desirable ones after tasting them and not liking them. That opened durian in the picture sure looks yummy! I don't really love durians but I've tasted some really really good hybrid in Kedah - can't remember the names...and I do love the Thai dessert - durian with glutinous rice and santan which is nicer than with mango! And durian cake at Secret Recipe! Yummy! oh I love durians; the smell, the taste...hmmm YUMMY!!! Btw, if durians are off-season and you simply have to have it, go on down to the Chinese restaurant in Mandarin Oriental and ask for their durian dessert. It is real durian, believe me. Oh..but you have to pre-order a day ahead. tekkaus, wow! Started eating durian while still a toddler? I was only drinking milk at that time! lol. Never tried eating with normal rice, but with glutinous (Thai people call it sticky rice) it was heavenly! Durian dessert at Mandarin Oriental even during off season? Where they get their durians from if not available in the market? suituapui, oh yes. I love the Thai's sticky rice with durians! Absolutely delicious! The Secret Recipe durian cake is excellent too, but I've found a better one at Bon Bon in Petaling Jaya. acura, why? I can never understand. I guess we all have our own likes and dislikes. 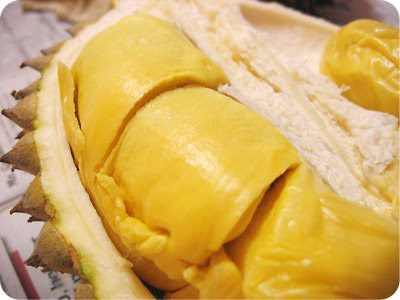 cbenc12, maybe you feel a bit "full" (uncomfortable in the stomach) after eating durians? I love fruit and would love to try one but I think the smell has scared me now. LOL To bad we can not get them here in the states seeing that I will not be traveling any time soon :( but when I do I will try one. Very informative site and I enjoyed visiting.